Im 23 years too late!! Been out of action for how long i dont remember...havnt seen the sun rise and heck its surprising that im up today at this hour (and god save me) 'blogging'. Just wanted to breathe out here and keep my webspace intact....after all i need to conquer the universe!! And what in the earth have i been upto?? Just being my supine self....i needed some thing to just relive me off all the crazy things runnin in my head right now and trust me.i havnt a clue what im typin here....pardon any typos (d otherwise)...well, to whomsoever happens to read this (if any that is). PS: I really havn't done a proof reading of this post and neither wil I now...Publish - shut down - good night! Truly Music to the ears...Raga Aberi by L.Shankar has me going all ga-ga. I think its one of the few times ive been soo smitten by classical...and it looks like the trend will continue. Introduced by a dear friend of mine..he had to be awake all night streaming the song from his bro's machine and then get it onto mine ..phew..And to consider the fact that it took almost an entire day for me to actually listen to the songs. And now, there's no stopping...im really impressed. Right now, Raga Aberi rulz!! Before anyone can think of me to be prima dona of classical music, let me make it clear...I have no clue of the Raga's of the very Raga Aberi that im raving about soo much. But yes, Im seriously developing a taste towards it. As a matter of fact, Im not totally new to this field. Eons ago, I did try my had or rather leg at Bharathnatyam. The end result, I wouldn't want to tell right now. I have plans and I have no idea when and exactly how Im gonna fulfill them. Nevertheless, at this juncture, I would say "Let action speak for itself." "Speech is silver, silence is gold." "Empty vessels make the most sound." Before you think that Im recollecting my primary school knowledge, let me explain. These are sayings which we have heard all our lives. But then, frankly, it really doesnt work. Its not your work but how much you talk that matters in a career. Its not quality of work but your marketing skills that get you $$. Its not what you are but how you are that matters. Most of the proverbs are the things of the past..and I have to admit cause of my own experiences. In contrast, these are just apt for the present day. "Silence is gold, but you still need money to buy a beer." "Empty vessels make most sound and are the only ones heard." "Still waters undermine the bank." I think its high time i cut the crap and tell you something interesting that happened a coupla weeks back. That was one helluva experience. This 27 foot coconut tree that had been standing for 45 years in my house suddenly decided it had enough. 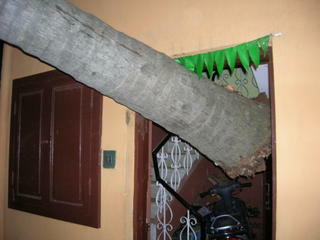 The tree cut off from its roots, pushed through our main door and fell over the neighbours terrace. A portion of the tree came right into out house shattering the front door. And all this at 9.30 pm in the night. We thought we will not be able to manage evena slight wink. But thank god for small mercies, there still are some decent police around. They helped us clear the mess and also volunteered to keep watch through the night (Remember, the front door was broken) Again, we do have some talent and quick thinking around the house..by joe, im referring to myself (ahem!.. )..and my dad, we managed to close the entrance with the broken door along with some chairs, tables and a scooty pep to keep support. Thankfully, we had a peaceful night's sleep. Its been a long day at work today...considering the fact that i dont work beyond 7.30 PM! This thought has been passing my mind ever since i woke up this morning. As young kids we have all wondered what we would grow up to be. Ive asked my Mom a million questions. From an air hostess to i-wanna-be-steffi to a dancer to an actor to a doctor to a teacher to a software professional. And NOW, that im finally a software professional, i wanna truely traverse the path backwards! I think this happens to most of us, when we finally reach a stage, it feels so ticky-tacky. They all look just the same. Life stagnates after a while. How many people actually get out and go that extra mile for passion. I haven't reached that yet and neither have any familiar people i know. We are where we are either because of the dollar factor and the fact that there's already way too much and we just dont care. Its neither madness nor is it sanity, its just pure downright right! If they say, there is neither right nor wrong, then neither is there "Power" (ok...i did watch Sarkar recently). It feels like an apocalypse, dark and dirty. How long should one turn his head and pretend not to see thw world. How many more eyes must one have to see the sufferings of the world, How many ears should one have to hear the cries of the people, How many wars should a man fight to finally realize that peace transcends everything, How many deaths will it take to know that people are dying..How many more tsunami's should strike before an effective disaster mechanism is set in place!! Three parts of your heritage ??!! I can cook most of the South Indian dishes. I can drive a car! I am going to be very rich lady one day. Phhhsssshh.....a four wheeler past a puddle of rain water.Two wheelers on either sides drenched out with the mud. Slush, gush..put any "ushy" words and this will typically describe the state Bangalore has been for the past two weeks. Weather seems to have calmed down now...but it could anytime be a change in trend again. Come to think of the state of the city! There were all possible trees that got uprooted, all possible potholes that got even bigger....the city happened to see many a make-shift kind of lakes / ponds all over the place. Is this what the city that boasts of being the Silicon Valley of India has to offer? Whom do we blame? The government ...the people..? Well matter of fact everyone i guess. I dont think i would want to go into the game of politics here. Its pretty much clear the nuisance of this entire system. Yet, time and again we like fools vote the wrong into power. Infact, i wonder if there are any rights? Recently the city also witnessed a surge in the crime rate and the administration took to the ageold method of nakhabandhi..well it might have proved useful.But then,is this what this city has to adopt? Cant there be technology-driven better ways? Has there been any kind of initiative or drive among us to do something for this city? I admit it. I havnt done anything for this once beautiful city and my heart does cry out...I have breathed,lived , enjoyed bangalore for 22 years now. But what have i given instead. People never indulge in an activity that does not have any monetary gain. And wow! wot am i talking here...some time,energy and god-for-sake even some amount of one's money to be shelled out.Crap! We have become sooo insensitive to react to all these.Take me for example, im bullshittin all possible things out here but havnt dared to make a difference..well, im ordinary too..easy, very easy way out!! Cmon' there has to be some solid ways of addressing these issues..and i take an oath today to do my part..atleast i can try. Damn, its really been a frustrating week to have seen all the water (sewage and otherwise),trees (on roads and on cars)..sigh! Well, discussions, debates, forums,and even me writin up on this blog about the matter...will there ever be a solution? IF anyone happens to stumble upon this piece, care to leave some expert comments. Im really trying to think this time!! So till that time, lets enjoy the rain cause its after all just the weather. A bit too late but never too late for a rendezvous with blogging!